How To Install Stainless Steel Tile - It's easier than you think! Stainless steel tiles are installed very similarly to regular tile. The principles for design and layout are very similar. They are cut with a tile wet saw using a diamond blade. It is best to start with a fresh blade. Cheaper blades tend not to last as long. If you have quite a bit of cutting to do, we recommend a high-quality blade. Cutting without water may cause discoloration of the tile. Hardboard backed tiles are installed with construction adhesive. Many varieties are available. Liquid Nails is the most common, but we prefer PL Premium by Loctite. It is a urethane adhesive that cures in the presence of moisture, and once cured, is not affected by moisture. If you are installing Fiberock backed tiles, you can use any conventional mastic appropriate for the substrate to which you are tiling. Thinset is the most common mastic, however, there are many others. Many people choose to install the tile without spacing and do not grout. You may choose to grout if you are mixing steel tiles with other mediums (like stone or ceramic) and want to have a consistent look. If you are installing in a wet environment (such as in a shower or outside), you must grout. If you grout, choose a non-sanded grout. You must seal the grout to prevent wiping a hazy film from the grout onto the tile when cleaning. Consider using a urethane or epoxy grout in more challenging environments (commercial). Home Depot offers Fusion Pro, a single component grout that works well. These types of grout resist staining and do not require sealing. A final tip on grouting; you can float the grout, but we recommend applying the grout directly to the joint with a grout bag and dress with a finger. Colored caulk to match is available in tubes that can be used in a caulk gun. When cutting tiles with a wet saw, be sure that the metal side is up. 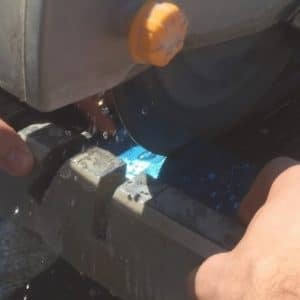 Metal tiles can also be cut using a hacksaw, jigsaw with a tungsten carbide fine tooth blade (22 teeth or more per inch), band saw with a fine tooth blade or a Dremel with a Cut-Off wheel. These non-wetted cutting tools are best used on cuts that will be covered or concealed. For example, if you need to cut a notch out of a tile around a light switch, you can cut without water because any roughness or discoloration should be covered by a wall plate. Holes can be drilled using a high-speed drill or hole saw. CAUTION! Cut tile may have sharp edges. Always use safety glasses when cutting any kind of tile. Read and understand all safety warnings associated with any power tool. When installing 1”X12” and 2.5”X12” tiles, make sure the tile is straight when installing. During shipping, the tile can sometimes get a slight bow. Before installing, use your hands to slightly bend the tiles back into a flat shape. Trial fit the tile on the wall before applying adhesive. For best results, the substrate must be smooth and even. Our tiles are shipped with a protective PVC film covering. The PVC is there to keep the tile from being scratched while being machined and shipped. While you can remove the film prior to installation, we recommend that you leave the PVC on until installation is complete. The PVC will continue to protect the tile during installation and make cleanup easier. However, you will want to peel the PVC away from all edges and corners so that when the tile is butted together, the PVC is not trapped and remain in the joint. While this is a tedious process, it will help ensure a flawless finish. The PVC may leave a little residue on the tile but can be removed easily with stainless steel cleaner. You may find scratches or scuff marks on the PVC film when you receive them. This means it did its job during manufacture and shipping and the tile should be unblemished. If there appears to be a scuff or scratch mark on the tile, simply rub the mark with your thumb in the direction of the grain.